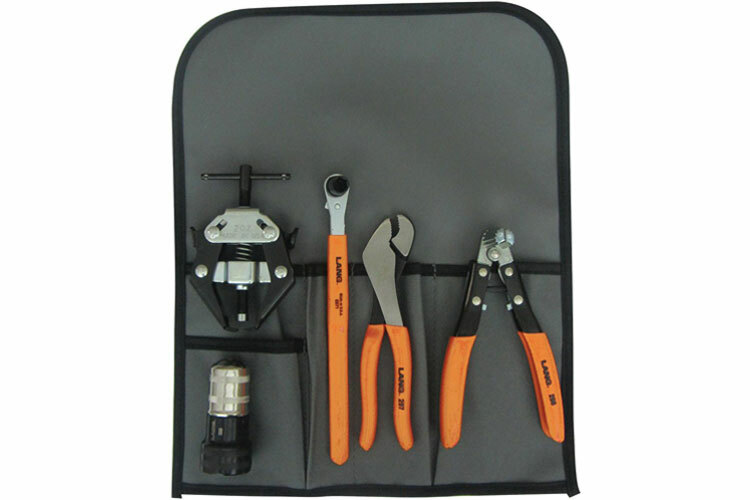 Lang Battery Service Kit includes: Terminal Puller, Nut Pliers, Terminal Brush, Terminal Spreader and Cleaner, 5/16'' x 10mm Extra Long Terminal Wrench. Lang Memory Saver Kit allows for multiple ways to supply 12 volts to a modern vehicles memory system. Lang Memory Saver Kit maintains the memory of the on-board vehicle computer (CCU) when the battery is disconnected. Lang Extra Long 5/16'' Ratcheting Side Terminal Battery Wrench. Designed to remove/install 5/16 battery terminals. Insulated handle helps prevent electrical shock. Extra length (9-3/4) allows for easy access to recessed terminals. Lang Battery Terminal Puller. Easily remove battery terminal cables, preventing damage to battery posts. Durable jaws open 1/4'' to 1-1/8'' to fit most battery terminals. Lang Battery Nut Pliers. Use to easily loosen and tighten nuts on battery terminal clamps. Handles are offset for working in confined areas. Jaws are serrated for a firm grip. Lang Battery Terminal Spreader and Cleaner. Use to clean corrosion from the cable clamp. Sharp teeth effectively clean corrosion from the cable clamp. Lang Battery Brush. Use this durable steel brush to remove corrosion and dirt from battery terminals and cable clamps. External brush cleans cable clamps and internal brush cleans terminal posts. Lang 5/16'' Ratcheting Side Terminal Battery Wrench. Designed to remove/install 5/16 battery terminals. Insulated handle helps prevent electrical shock. For use on all batteries with horizontal ridges. Non-slip, acid resistant, riveted rubber grip pads secure a firm hold on any battery up to 7-1/2'' wide. Accommodates battery size from 3-1/2'' to 7-3/4''. Jaws made from zinc plated carbon steel. Reinforced conveyor strapping handle. The 41701 Lang Battery Service Kit is one of thousands of quality tooling products available from MRO Tools. Please browse Lang Automotive Battery Tools and Computer Memory Savers for tools similar to the 41701 Lang Battery Service Kit. 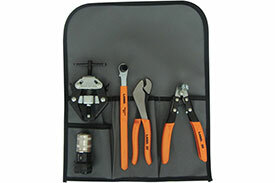 41701 Lang Battery Service Kit description summary: Lang Battery Service Kit includes: Terminal Puller, Nut Pliers, Terminal Brush, Terminal Spreader and Cleaner, 5/16'' x 10mm Extra Long Terminal Wrench. Quantity discounts may be available for the 41701 Lang Battery Service Kit. Please contact MRO Tools for details.